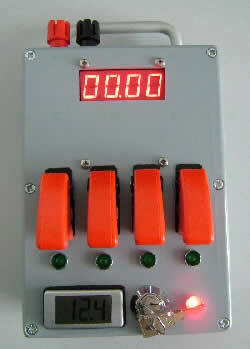 The Launch Controller is designed to provide a simple, yet flexible hand held, 4-channel launch control unit. The Launch Controller is able to directly launch model, mid and high power solid motor rockets, via a fire channel, or to remotely launch hybrid and liquid powered rockets via 3 of the 4 channels connected via a relay box at the launch pad. The 4th channel is designed to be used as an umbilical disconnect for liquid rockets and amateur hybrid rocket motors, but can be used for other purposes if required. Currently, it is designed to be used as a launch controller for any solid rocket motor, any hybrid rocket motor (such as R.A.T.T.Works, Skryipper, West Coast, Contrail, Hypertek, Aerotech, Propulsion Polymers) or the Systeme Solaire liquid rocket engine. There were a number of places where it was felt that improvements could be made to existing launch controllers. My personal view is that the majority of launch controllers are lousy. I've yet to see a commercial launch controller for rocketry that is either not particularly well put together either in terms of construction or ergonomics, or has atrocious build quality (in particular, I'm no fan of the "build the controller into a toolbox approach", or the "use a rotational switch rather than good quality individual toggle switches approach", or the "use cheap small switches instead of good quality large, reliable switches approach"). Many home made launch controllers are put together by people who have a rudimentary grasp of electrical theory, and as a result, dangerous practices such as using mains connectors, or unsafe continuity circuits, or the cheapest components get propogated. 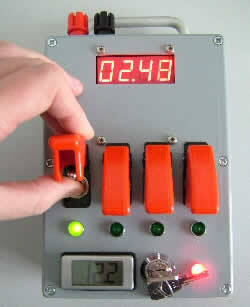 With the home made launch controllers, it is then little surprise when misfires or igniter failures occur. Cheap does not equal safe. With this in mind, I set out to design a robust launch controller with decent (but not over the top) priced components, that could eliminate many of the problems seen in launch controllers, and also add some new features that could be beneficial. I've actually been working on the design of the launch controller for the last 5-6 years, but each time I have thought I had something I liked, I saw something when at rocket launches, that made me adjust my design. In the end, I just decided I had to freeze the design with what I currently had (about the 30th version of the design! ), and move forward with construction. Following the best practice methods used in the professional rocketry industry, as well as with military rocket propulsion and pyrotechnic systems, the Launch Controller does not have built in continuity detection. The launch leads are plugged into the launch controller. The key is then inserted into the launch controller and rotated 90 degrees clockwise to the arm position. If the system is working normally, a red LED will light up. The key cannot be removed from this position, and must be rotated anti-clockwise 90 degrees to the OFF position for it to be removed. Once the Launch Controller is armed, all channels are fully operational. Each channel is operated by a momentary (biased), heavy duty toggle switch. Each switch is fitted with a flip top toggle switch cover. When the toggle switch cover is closed, it automatically forces the switch into the OFF or safe position. The toggle switch cover essentially performs a similar function to a 2 switch launch control system, in that each channel requires 2 actions to operate it. 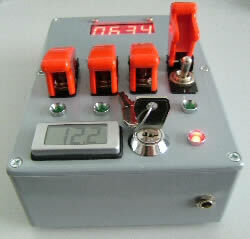 The switches are deliberately large enough for use wearing gloves in cold weather (which most manufacturers don't seem to think of when they produce launch controllers with rotational switches or little toggle switches), and the toggle switches chosen, were rated for high current and long life. The 4 digit, 7 segment LED display is used to time how long the oxidiser solenoid valve has been activated to fill the rocket's oxidiser tank. When the fill switch is activated, the count is started. When the fill switch is released, the count pauses, and when the fill switch is activated again, the count resumes from the paused value. This feature was added after dozens of hybrid flights had tended to produce similar comments; "how long do you think it has been filling?". By having the counter, It solves this issue at a stroke. 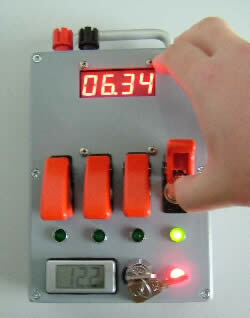 A multi digit LED display could be used for many other purposes (count down, count up timer, battery voltage, temperature, pad battery voltage), however, for hybrid rocket motor operations, the oxidiser fill operation is the most consistently useful function, so the decision was made to focus on that for the prototype launch controller. Another comment that is often heard around launch controllers is "do you think the battery is OK?". To solve this, a low current, 3 digit, LCD display, was fitted. At a future point, this functionality may be incorporated into the main LED display. 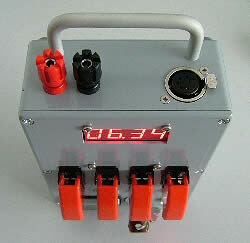 The launch controller is fitted with a 2 Amp hour Sealed Lead Acid rechargeable battery. Naturally, with everything fitted inside the launch controller, a method of charging the internal battery without removing it is neccessary. For this purpose, a 2.1mm socket is fitted. A standard 12 Volt battery charger is then plugged straight in to the launch controller. The launch controller electronic circuit is designed so that the launch circuit for the 4 channels is separate to the rest of the circuit and kept as simple as possible. Adding complexity into launch control circuits for firing rockets adds in extra failure modes, and potentially reduces reliability, so it makes sense to keep the launch control / firing circuit as simple as possible - with the added advantage of easy maintainability - after all, it is usually possible to repair a firing circuit that is little more than a few wires and a switch, whereas if it has various integrated circuits and other electronic components, unless you have a toolbox full of spare parts, then you are stuffed. Adding in complexity to the rest of the launch controller, be it digital counting displays, measurement from sensors, or other more advanced features is implemented separately, so it does not interfere with the firing ciruit. The launch controller uses standard 4mm terminal posts, to plug in banana plugs, or wire connections. The terminal posts are connected to the Fire channel. This provides the ability to directly plug in launch leads from various other launch systems, and to enable direct fire control of solid rocket motor powered model rockets as well as high power rockets. For hybrid rocket launch control operations, a 5-way XLR socket is currently used, although in order to provide compatibility with some other planned hybrid launch controllers in the UK, I have proposed a standard to a few other hybrid rocket minded individuals, which will involve swapping the 5-way XLR socket out for a 7-way XLR socket. The reason for using an XLR connector is because it provides a rugged mechanical connection, and is used for applications where robustness is key. The reason for using first a 5-way XLR connector, and then a 7-way XLR connector, is firstly because of the number of channels required in the launch controller, and secondly, 3-way XLR connectors are already widely used for PA and professional audio and the entertainment industry, and 4-way XLR connectors are already widely used for 12 volt power in the professional video, film and photography industries. The now superceded (for this application) 5-way XLR connector and the 7-way XLR connectors do not seem to be so widely used with any particular pinout standard, so it made sense to use a connector which would not result in confusion (i.e. devices for another application and voltage being wrongly plugged in to the launch controller, and then destroying some other piece of equipment). It is another reason I always discourage the use of mains connectors in launch controllers, for safety reasons. Where are the captions on the launch controller? The text to go on the launch controller to identify the switches has not been applied yet, that's all. Have you thought about other versions of the launch controller? Have you thought about selling the launch controller? Yes, and in fact this launch controller was designed as a prototype for testing various ideas for a commercial launch controller. In conjunction with a few external bits of cleverness, the launch controller could be used as a replacement for a Hypertek launch controller, and launching any GOx high current ignition or pyro grain ignition hybrid, so there are thoughts about this. The problem is, it would not be cheap. It was built to a specification, not a price. The cost would probably be comfortably into 3 figures. Then again, it is a very high quality launch controller. What about additional ground support infrastructure? The parts have been bought though for additional modules for hybrid ground support operations. Again, these are designed to a specification, not a price, so they would not be cheap. They would be high quality and robust however. The whole Launch Controller would not have been possible without the marvellous talents of James Macfarlane. Not only did James provide the sounding board for my wilder designs for the launch controller and its electronic circuit (and generally scaled them back to something more practical), but he also worked very hard to machine the box, wire up the connections, and test the launch controller very thoroughly in his electronics lab. Having the facilities of his lab for construction and the testing was a huge benefit, and I shall be buying him beer for many years to come I suspect.